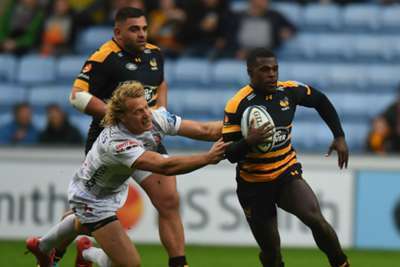 Christian Wade has not been included in Wasps' squad to face Bath on Saturday amid reports the prolific wing has quit the club in a bid to start a new career in the NFL. The 27-year-old did not feature in a crushing European Champions Cup defeat at Leinster last Friday due to illness. Wade will also play no part in the Champions Cup clash with Premiership rivals Bath at the Ricoh Arena. The flyer, who is third in the list of all-time Premiership leading try-scorers with 82 in just 130 matches, is said to have informed Wasps that he has played his last game for the club. Wade has won just one England cap, against Argentina in 2013, and the flyer has reportedly grown increasingly frustrated at being overlooked by head coach Eddie Jones. If the rapid Wade lands a deal in the United States, he would follow in the footsteps of former England Sevens international Alex Gray and ex-Worcester Warriors lock Christian Scotland-Williamson in swapping rugby union for the NFL. Wasps have not made any comment on Wade's future. 2011 - Since his @premrugby debut in 2011, @ChristianWade3 has scored more tries (82), made more breaks (190) and beaten more defenders (381) than any other player. Overall, only Tom Varndell (92) and Mark Cueto (90) have scored more @premrugby tries than Wade.